This year, voters must choose whether to give a full four-year term to current City Attorney Barbara Parker or to longtime District 1 Councilmember Jane Brunner, both familiar faces in Oakland politics. When Oakland voters nixed Measure H in 2011, they decided how the city would select a city attorney this year. Until 1998, city officials appointed someone to the office, but under that year’s “strong mayor” initiative, the position became an elected one, which was held by John Russo from 2000 until 2011. After Russo resigned in 2011, voters failed to pass Measure H, which would have returned the position to an appointed one. As a result, in November voters will once again decide who should represent Oakland in lawsuits against the city and give councilmembers legal advice. The function of the City Attorney’s Office is to provide legal counsel to the city’s employees and legal consultation to city councilmembers. The office does not represent individuals in private legal matters. “The office is the equivalent of the general counsel of a corporation,” said Russo, now the City Manager of Alameda. Prior to serving 11 years in the City Attorney’s Office, Russo was a member of the Oakland City Council as the representative of District 2. “There is some confusion with the public—people think the City Attorney is the District Attorney,” Russo said. But in fact, the District Attorney is a county official who represents the government in prosecuting criminal cases. 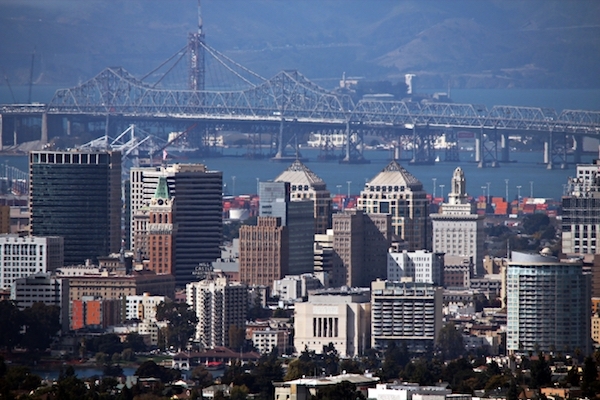 In recent years, the Oakland City Attorney’s Office has been in the political spotlight. In 2011, Russo stepped down in the wake of a philosophical clash with other city leaders over gang injunctions, which restrict the movements of alleged gang members by enforcing curfews and banning identified gang members from interacting with one another. During Russo’s term, the office implemented two gang injunctions, one in 2010 against members of the North Side Oakland gang in North Oakland and another in 2011 against members of the Nortenos gang in the Fruitvale area. When Russo resigned in the middle of his term, he recommended that his chief assistant, Barbara Parker, replace him as the acting city attorney. The city council later appointed Parker to the job. Parker now must run for the seat because she was only appointed to finish the duration of Russo’s term, which is set to expire early next year. Parker has worked in the City Attorney’s Office for 20 years and served for 10 years as Russo’s chief assistant. Parker, who holds an economics degree from the University of Washington and is a graduate of Harvard Law School, also served as an assistant U.S. Attorney for the Northern District of California from 1978 to 1983. “I am running because I think it’s critical the city has an attorney who has broad experience across many practice areas,” Parker said. In recent months the City Attorney’s Office has taken on issues involving medical marijuana dispensaries and reducing prostitution in the city. In early October, the office filed a lawsuit against the federal government to stop the forfeiture action against Harborside Health Center, a medical marijuana dispensary in East Oakland that provides cannabis to patients with certain medical conditions who have a valid California prescription card. The forfeiture action could result in the Harborside property being taken over by the federal government, which holds that the dispensary is operating in violation of federal law prohibiting marijuana distribution. According to Parker, who strongly supports the decriminalization of medical cannabis, the city filed its legal complaint because a federal statue limits civil forfeiture actions to no more than five years after dispensaries have been operational—Haborside has been operational for 6 years. “Instead of shutting down dispensaries that are operating under Oakland’s regulations and state law to provide safe and affordable access to medical cannabis, we believe it is important that the government’s scarce resources should be dedicated to fighting the real crisis in Oakland—violent crime and illegal guns that are snuffing so many lives,” said Parker in an interview this week with Oakland North. In February, the City Attorney’s Office also sued the Economy Inn and the National Lodge hotels, charging that the hotels are responsible for preventing prostitution on their properties, but are instead allowing illegal activities to happen. A judge ruled in August in the city’s favor and ordered both hotels to close their doors for one year and the five defendants in the case to pay $15,000 each in damages. “These hotels were magnets for crime and blight and public nuisance,” Parker said. If re-elected, Parker said she plans to serve as the city’s “watchdog” by providing impartial, honest and independent advice regardless of a person’s political influence. She also said that she will focus on public safety. “If we can address our public safety, Oakland would soar,” said Parker. Parker plans continue some of the anti-blight policies she has already instituted while in office, including requiring banks to maintain their foreclosed properties. According to Parker, the city has already collected more than $130,000 from Wells Fargo for failing to maintain some properties. The office has also started to sue slumlords who are not maintaining properties, she said. “This work [reducing blight] is critical to Oakland’s renaissance. It reduces crimes and enhances quality of life for all Oaklanders and will help to attract residents, businesses and visitors, bringing more revenue to address Oakland’s challenges,” Parker said. Parker also supports the two current gang injunctions. “I am comfortable with the council’s policy approving completion of the two pending injunctions against the defendant gang members and prohibiting funding of any additional injunctions until the city completes a cost-benefit analysis of the two pending injunctions,” she said. The challenging candidate for the City Attorney’s Office is Jane Brunner, who has served as Oakland’s District 1 councilmember since 1996. Brunner said she decided to throw her hat into the ring after she decided to resign from her council seat earlier this year. “I’ve been watching that office for 15 years, and I think it needs to be changed,” Brunner said. Brunner has been a civil rights and labor attorney in private practice for over 20 years. She is an attorney at the Oakland-based civil rights law firm Siegel & Yee, which represented alleged gang members who were named in the Fruitvale gang injunction. Brunner was the president of the Oakland City Council from 2009 to 2011 and she is currently the chair of its Community and Economic Development committee. She holds a Bachelor of Arts degree in philosophy from UC Berkeley and a law degree from the UC Hastings College of Law. After her 16-year tenure on the city council, Brunner considers one of her biggest accomplishments the recent agreement with the city council and the private companies California Capital and Investment Group and ProLogis for a $1 billion development project at the site of the former Oakland Army Base. According to Brunner, the development project will produce over 2,800 construction jobs and 2,000 permanent jobs. Brunner also believes she has taken the lead on foreclosure issues in the city. At her North Oakland office, she compiled a list of all the properties that were entering foreclosure in her district and formed a team that would visit every house and give out information to homeowners about the foreclosure process and how to work with banks. In December 2011, Brunner also introduced a pilot 5-minute grace period parking program that is pending city approval after the city Finance and Management Committee recommended the action should become permanent. The idea for the 5-minute grace period came to Brunner after she received complaints from drivers in the city, she said. The program allows a car that has been parked at an old-fashioned meter (one that takes coins, not the computerized machines that print out receipts) to park for 5 minutes without being issued a parking ticket. Those can cost drivers $68. Some of her other accomplishments include creating two new dog parks in North Oakland and helping to get over 3,000 new trees planted in the city. Brunner said she is running on a platform that aims to maximize what the City Attorney’s Office can do despite Oakland’s limited resources. “I will manage that office so it can do more with less,” said Brunner. Her plan for the office includes responding quickly to lawsuits and settlements, improving leadership in the office and increasing efficiency. “It takes a very long time to get a response—I hear from city staff that they don’t get responses from the City Attorney’s Office,” Brunner said. Brunner said she believes the City Attorney’s Office can operate more efficiently by increasing staff productivity and limiting the number of outside attorneys who are usually hired to handle legal work for the city. According to Brunner, hiring outside attorney can cost the city more money in the long run. She also said she believes the extra money the city is spending on outside attorneys could be used elsewhere. “It’s nice to hire attorneys, but at this point the city needs to hire police,” said Brunner who believes crime in the city is “off the hook.” She said safety is the number one issue in Oakland. Brunner said she plans to support the gang injunctions since city council has agreed to enforce them, although she does not agree with them. “As city attorney I would implement whatever the council votes for. Personally, I don’t think the gang injunction is the answer,” said Brunner. Brunner plans to continue to support medical marijuana dispensaries in Oakland and supported last month’s lawsuit in the defense of Harborside. “I think as long it is legal, and dispensaries are following the state and local laws, medical marijuana should be permitted to happen,” she said.